My favorite way to share what I create is face to face. I love being able to explain how I make my products. Better yet, I get new ideas by talking to customers, and get excited by taking special orders. If that’s the way you like to shop, look for me at farmers’ markets and fairs, or just call or email. However, I know that it is sometimes more convenient to be able to shop online. So I am beginning to offer some of my most popular products here. I will be adding items in the next month, so check back if you don’t see what you are looking for. Better yet, get in touch! 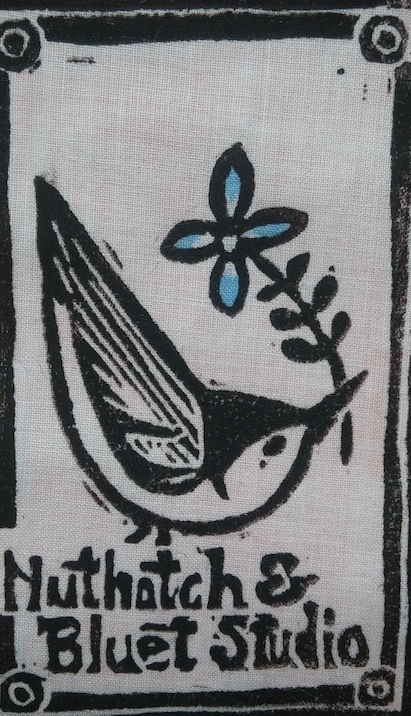 Set of 4 handprinted cotton napkins. Each set includes 4 napkins with the same print. Available prints are shown in the photo: Chickadee, Flock of Birds, Sunflower, Olive Branch, Honeysuckle, and Flower. Color options: Turquoise, Beige, Yellow, Green, Red. Price includes shipping in the US.